In this delightful new adventure featuring the mismatched crime-fighting duo of film critic Mitch Berger and Connecticut state trooper Des Mitry, Mitch's New York City past and his Dorset present collide head on. Back when Mitch was a chubby thirteen-year-old living in Stuyvesant Town, Beth Breslauer, a lovely blond single mother, lived across the hall with her son, Kenny. These days, she's a wealthy widow who owns a condominium in the Captain Chadwick House, the Dorset Historic District's most exclusive condo complex. Kenny is engaged to marry Mitch's yoga teacher, Kimberly Farrell. Kimberly's parents are Beth's neighbors. They are also social pariahs. Her father was one of the Wall Street power brokers responsible for the sub-prime home loan meltdown and her mother is praying that Kimberly's elaborate engagement party will endear them to their lost friends. 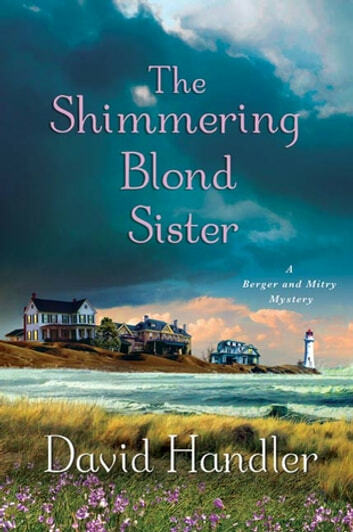 Meanwhile, Augie Donatelli, a retired police detective who manages the Captain Chadwick House, is positive he's figured out the identity of the infamous Dorset Flasher, an elusive, ski-masked figure who has been terrorizing wealthy widows after dark. He also believes that Beth is the proud descendent of a long line of professional thieves. He demands that Des do something about it, but Des dismisses his charges as the wild rants of a lonely, bitter drunkard, which is rather unfortunate---because when Augie turns up dead, Des is included in the round-up of suspects. That leaves it up to Mitch to find out what really happened, even though it means he'll have to find out more about the people in his life than he ever wanted to. 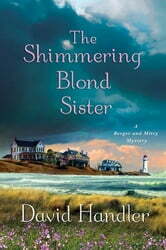 The Shimmering Blond Sister is David Handler's most emotionally gripping book in the series yet.